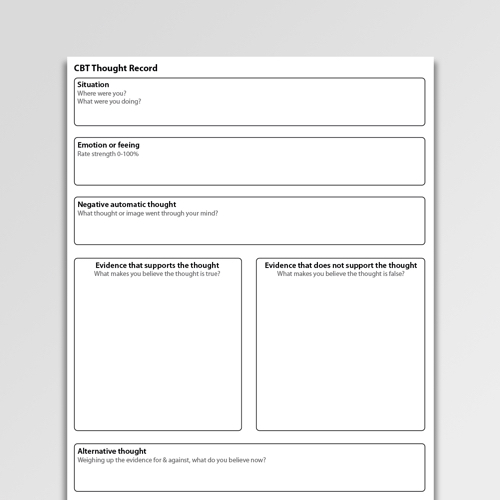 The CBT Thought Record is an essential tool in cognitive behavioral therapy. Thought challenging records help people to evaluate their negative automatic thoughts for accuracy and bias. 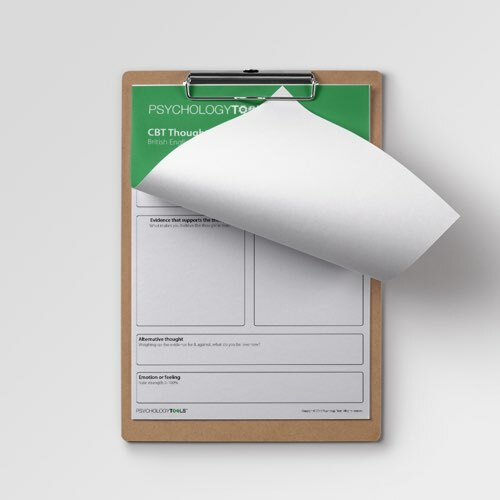 This CBT Thought Record is in portrait format which some clients find makes it easier to conceptualize the ‘evidence for’ and ‘evidence against’ component. The CBT Thought Record (Portrait Orientation) is a CBT thought challenging/disputing record in portrait orientation as opposed to the traditional landscape orientation. Some clients find this organization easier to understand as it draws attention to the ‘evidence for and against’ disputing sections of the worksheet. 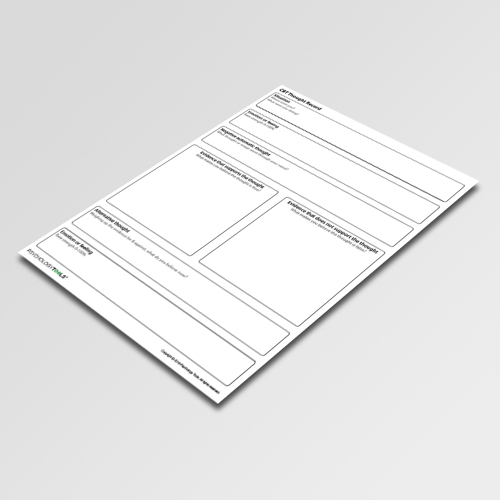 Start by cueing the client’s memory for the NAT by directing them to think about where & when the NAT occurred. The cue for completing a thought record is usually a sudden change in emotion. Record the emotion felt and it’s subjective intensity. Record the NAT. Helpful prompts are “what were you thinking about when you started to feel that way?” or “what was going through your mind as you started to feel that way?”. NATs can be images as well as thoughts. In the case of an image ask the client to reflect on what the image meant (e.g. if the client has an image of themself frozen to the spot it may have idiosyncratic meanings ranging such as “I’m weak”). Record the evidence for the selected NAT. Record any evidence which contradicts the NAT. Clients may need help to overcome their ‘blind spots’. Depersonalize the issue by asking what a friend might say. Write a new thought which synthesises all of the recorded information. The new thought may be considerably longer than the original thoughts. It may not necessarily be positive, the aim is to counter bias in the original thought. In the final section re-rate the client’s emotional state in light of the updated thought. 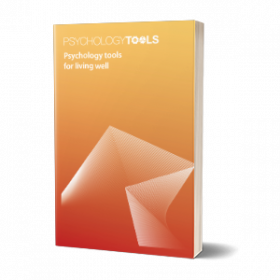 In therapy clients often need assistance and practice at identifying the link between thoughts and emotions before they move on to challenging thoughts and substituting more helpful thoughts for less helpful ones. 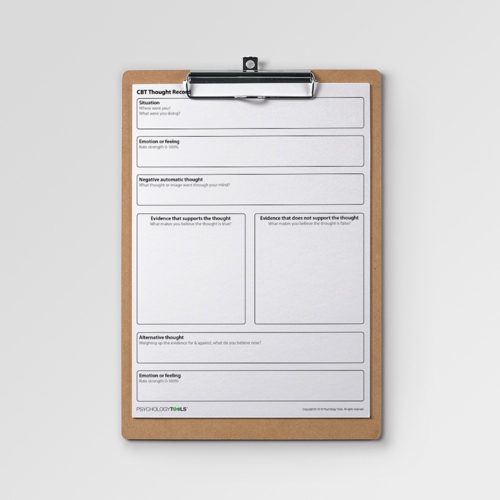 Some clients might find it helpful to practice identifying NATs using a Simple Thought Record before introducing the complexity of evidence-gathering and thought challenging.